It takes courage to be an artist. Many people don’t realize this in that first moment they pick up a pen or paintbrush, but they are put on display with the creation the second of its completion. My favorite example of what I mean comes from being married to a dancer and choreographer. See, when a dancer performs, especially in a piece that they have created, their audience is watching many things. Yes, the hope is that the audience is focused on the artistic performance, expression and emotional message of the piece, but an audience does so much more than that. They also may compare the dancers in the piece (which are better, which are worse), they might try to find the artist’s personality in it, they may look for mistakes, they may even study the bodies of the dancers. Of all of the art forms, this is in my opinion the most exposed and bravest. But when you are writing a book, in the beginning you are alone, probably sitting in front of a desk someplace, a large drink with caffeine right nearby (well, that is me); it’s hard to remember that the real world is out there. However, it is out there and if your creation finds an audience, the audience will find you…. When I think of Harper Lee, I always imagine her as Scout. I can’t help myself. We have all heard the stories that the characters in To Kill A Mockingbird are based on people from her childhood, her hometown. The thing is that when she recreated her father as the wonderful Atticus Finch, her father was no longer her own. She now had to share him, a startingly thought I am sure. Atticus became the father we all wanted. When the American Film Institute in 2003 did their list of “100 Heroes” (they made a bunch of ridiculous lists like that), they put Atticus Finch at number 1. Stop and think about that for a moment. Her father figure ranked up above Indiana Jones, James Bond, Rick Blaine and Rocky. Her father, a poor attorney in a small southern town just trying to do what is right took on characters that saved the world a hundred times over and won. That is the power of Harper Lee’s first novel To Kill a Mockingbird; and for whatever reason, it is also her last novel. I’ve read quite a few books and articles on Harper Lee and her masterpiece. Some are cruel (even going so far as to point to another genius being behind the work, like Truman Capote), while others paint her as fragile; like a piece of crystal that has already been cracked a little by the exposure of her life to the entire world. I’ve also read pieces saying that she loved the book and others that declared that she regrets even writing it. Bitter? Happy? Resentful? At peace? There is an opinion portrait out there for any kind of a Harper Lee you want. JD Salinger I can understand a little. 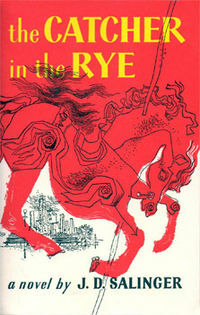 It may be weird to say that and, I must admit, this is based on a lot of hearsay, but if all he did for the last decades of his life after writing The Catcher in the Rye was to just write his own books (you read stories about safes or hidden rooms in his house to special bank vaults) and skip the publication…. Well, I get that. He already paid his due! His great work of literature was established, why deal with the follow up if he didn’t have to? Writing is a solo enterprise in the first place, existing first in the crevices of our minds, why not return to that aspect of it? Let others read the debates and reviews of which new books are better or worse than The Catcher in the Rye. He could just move on to another story, letting more of his characters free and than to wait in storage until the right time. It almost sounds like a writer’s dream. Again, who is to say if any of this was the case? Salinger returned from the War with a lot of demons and maybe the isolation was more than about his creative choices. He wanted to be alone, first and foremost, but the sad thing is that up until the week he died I could tell you where he lived. I have the internet to thank for that. Yes, there were sites that actually gave you directions to his house. With those directions I had even spied it once from Google Earth. I must admit I felt a little dirty the day I did it. The blurry picture on the screen as the program centered more and more down on the only place Salinger wanted to be. I remember thinking, “Hello Holden, hello.” and I could not see a single book in sight. Calvin and Hobbes are not philosophers but their names are inspired by them. 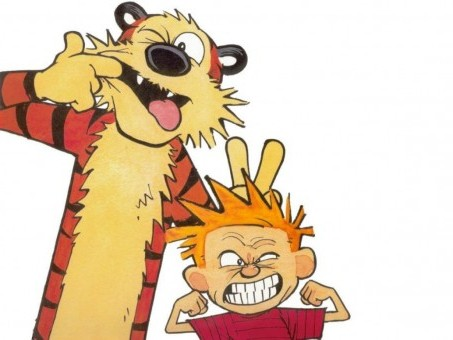 John Calvin was a French theologian and Thomas Hobbes was an English philosopher; how they became a six-year old boy and a stuffed tiger is anyone’s guess… or just the playful whim of the amazing Bill Watterson. I loved Calvin and Hobbes, even convincing my aged grandparents to save their comic pages in the paper for me, then buying each of the paperbacks as they were released. I grew up in the 1980’s, which means I was in the heyday of comic strips. I could open up a paper any day and see a new Peanuts, Bloom County, Far Side, and… Calvin and Hobbes. I can’t imagine the artform ever having a better decade than that. And it just stings that much more for me as a parent to know all of those strips are gone. My kids won’t have that, could never have that. In the giant hardcover volumes from 2005 containing the complete work, Watterson shared (only too briefly) what he is doing with his years since walking away from Calvin. He is painting, and even shared an example of the work he is creating right now. It was nice, I grant you, but I couldn’t imagine it justifying the closing of Miss Wormwood’s classroom or the blastoff of Spaceman Spiff to regions unknown. Maybe another way to think of it is that Calvin, throughout his adventures, wanted only to escape into his imagination, so much so that his best friend (his only friend) is a stuffed toy that only takes breath when Calvin is alone. He is the greatest introvert, and even at home with his parents he is alone, not understood in many ways… So, is Calvin Watterson? And is that where he has escaped to? The imagination he so longed for each day? It’s sad and beautiful all at once. And yet, when I think of our history of disappearing artists, writers, etc., he always seems the one most lost to me. I think overall the hard thing for the audience, the hardest thing honestly, is the silence. It is like that moment before falling asleep in the night when the world is quiet and our dreams, hopes, and fantasies start to sneak in. It is there that their imagined creations will always exist. A whisper in the night, but sadly never more than that. This entry was posted in Books, Writing and tagged American Film Institute, artists, Atticus Finch, Bill Watterson, Bloom County, Book, Calvin, Catcher in the Rye, Dance, Far Side, Fiction, Gregory Peck, Harper Lee, Hobbes, Life, Literature, Novels, Peanuts, Recluse, Salinger, To Kill a Mockingbird, Writing by Scott D. Southard. Bookmark the permalink. A dancer I knew, who took his art really seriously — classes daily, etc. — said the best thing about a night’s performance was that there would be another one. Works like that for writers, too. Well, for some… Harper and JD, not so much, sadly. Two words– Berke Breathed. Sigh and sigh again. And yeah – To Kill A Mockingbird may be the best book ever written. At least the most influential, the most widely read and admired. 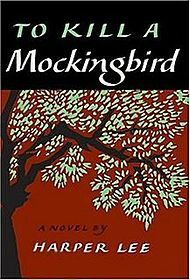 I think if I was gifted enough to write a book as amazing as To Kill A Mockingbird I would never write again. I’d spend the rest of my life baking cakes. Berke has tried to come back from time to time. I’ve read his later stuff, the magic is kind of gone. I think doing it on a daily basis was mad stressful, but his creativity flourished then. Sadly, his work is the most dated. Heck, I don’t even remember half of the Reagan stuff now! Ah, ye olde Reagan who? Then perhaps it’s a good thing to disappear. Me, too, Julia – said after eating 10 GS peanut butter/choc. cookies today. I know Lee and Capote were life-long best friends, and she did help him with In Cold Blood, but I’d never before heard of anyone attributing the merit behind To Kill a Mockingbird to him. Yikes! Thanks for sharing the video. Cheers! Interesting. I didn’t know that. Considering the wonder of her great book, the size of her heart doesn’t surprise me. I love that book (and film). Thanks for writing. You left out Gary Larson’s Far Side Cartoons, and Cathy Guisewite’s Cathy. Who else will chronicle the lives of talking dinosaurs? I mention Far Side in my list. It is one of my faves. I think many authors heave a sigh of relief after that first book is published. After all, for many, it took several years to go from a guy with an idea for a book to a decent writer with a contract. (Self-publishing craze set aside, obviously) In many ways, the 2nd book can be much harder. 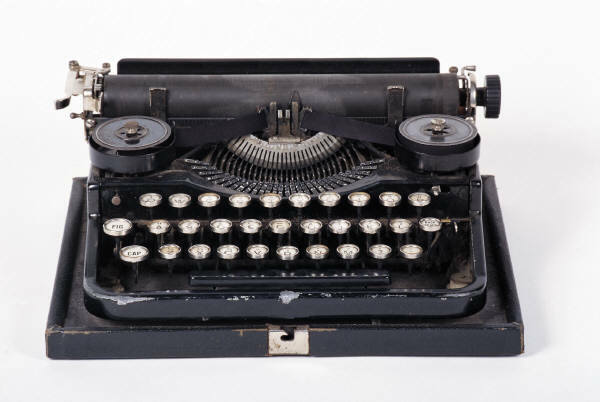 There’s a pressure, albeit self-imposed, that won’t allow for years to pass before the next story gets published. I can understand why some authors just chuck the dream. BTW, I had a cat named Hobbes for eighteen years. When my husband came home from grad school, Hobbes used to bound down the stairs and tackle him. Interesting point about the second book… and that cat sounds awesome (I’m sadly allergic to cats myself). Me too, and I’ve got the inhalers scattered around the house to prove it. Did I mention that it was my husband’s cat? Actually, I do love cats – just not close up. I wrote a piece a bit ago on the site about my allergies to cat (I said Pete the Cat was the only cat I like)… Still, I am more a dog person. Hi Scott, I quite enjoyed your editorial on the behavioral aspect of being a writer. I think you really nailed us. If we don’t begin as introverts, we certainly end up as them. Glad you liked it. Cheers! With the announcement on different entertainment and book sites (including this article on Entertainment Weekly- http://shelf-life.ew.com/2013/08/25/jd-salinger-new-books/), of possible new Salinger titles coming, it made me think of this book/author post I wrote earlier this year. To be honest, I’d be intrigued to know more about the possible new books. Honestly, I was hoping that what he was working on all these years to be a little newer, more revolutionary, different than what is described here… so I guess that means I am speculating on the speculating.